Timeout for Art when there is no Timeout for Art! I don’t think she’s missed one week; dear Cindy, hands full with responsibilities and obligations, finds time week after week after week to post a Timeout for Art. 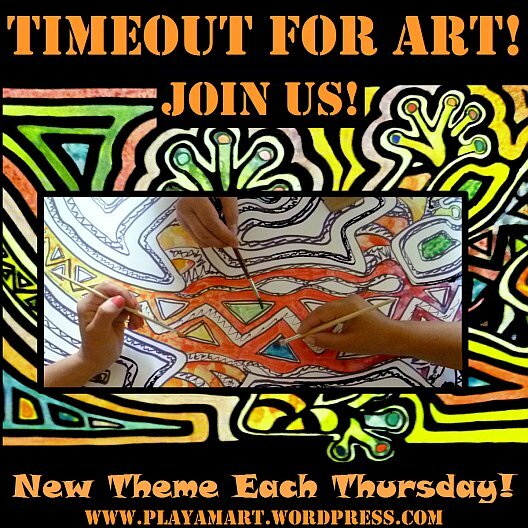 She often apologizes for lack of material, but she always dedicates a “Timeout” for art every Thursday. Thank you Cindy! You inspire me more than you’ll ever realize! Remember this mosaic in progress? My hands have been full with the ‘stairway’ project, and today I am typing with dried varnish on my fingertips. As soon as this is published, I’ll brush a second coat on the floor. Are you curious to see the progress?! The bamboo handrail – Also note the foor and corner bench! The bamboo was first painted white, then two to three coats of color were painted on each section. Black ‘joint’ bands added strength to the design. There are two new areas of just-finished concrete. One was a ‘skin’ over an old rough floor, and the other was a new small corner. The image above shows the first layer of paint beneath the heliconia painting. That afternoon, I stood on the recently-made bench above that area and floated shadows into the painting. The next morning a spasm in my back halted my progress; no problem, I rested and enjoyed reading part of a novel! That night Francisca, my dear sweet neighbor/friend, tapped on my door and cast a magical spell on my back. Always-working Francisca – bagging just-ground coffee. The next morning, I all but waltzed down to her tienda to show/illustrate that the back pain was totally gone! I’ll be writing a post about lovely Francisca soon, and will expand on her magic treatment…. Sometimes the ‘Ole Gray Mare would prefer to stay in the stable, but after a few mental ‘kicks’ she picked up her brushes and resumed her work! The more layers of paint, the more believable the effect! After brushing the floor twice with a wide, dry paintbrush and then wiping it with a damp rag, it was time to apply the rapid-drying varnish made for floors. The $50.00 can had been opened several months ago. After Marie and I placed a film of plastic over the top, the lid had been hammered into place. I’d learned my lesson years ago that this product will harden in the can if the lid is not sealed extremely well. Guess what? There was a two-inch layer of hardened ‘crust’ but below that was liquid. The next challenge was getting through the rock-hard layer. A hammer and chisel seemed the best option, and after about ten minutes, I reached the sought-after layer! Move forward, Filly! Timeout to sit in the corner bench and critique the work! Ahem; in order to move forward, I must ‘publish’ this and resume my work! I agree with Cindy – it’s a gift to create time in one’s day for art! Thanks for your support, and try to earmark a little time this week for a creative task! Wow! So much hard work! There is so much passion flowing through your words for what you do. Beautiful… and so is the outcome. Perhaps it is not finished yet but it is already beautiful and I can truly understand why you did not want to spill the hot chocolate… lol! You made me laugh! Yes, I was in a bit of a painting fog when I took the hot chocolate break, but it’s going to be fun to experiment with that concept – hopefully soon! Thanks, also, for your feedback regarding the project! Haha… too funny! Yes, I am looking forward to your chocolate experiements 😁and I admire you for what you are creating here! Great! Thanks!! I’m glad you like the progress! You continue to inspire me, my dear friend. This was a great message for me to hear/read this morning. And thank you for introducing me to another amazing creative blogger. Looking forward to engaging in many creative moments today. BTW, I love your neighbours!! Thanks, and I’m glad you enjoyed the progress of the railing and floor! Yes, my neighbors are so sweet and kind! I look forward to sharing some stories, hopefully soon…. It’s coming beautifully together your “stairway” project. Love how you work with colours and natural elements, whether rocks or bamboo. Ha! I don’t remember if you saw this one, which is about the size of a grapefruit..
As always, thanks for your support and feedback! You have more imagination than any six people I can think of! Delightful. Thanks, Hugh! You gave me a big smile! You do inspire me. I love your resourcefulness and use of color with abandon. Your creativity is off the charts Z. Thank you so much! There are so many great natural materials to work with, so it’s easy to be inspired! I laughed at your skinned varnish. How well I know that. It’s hard to avoid. I always decant into a smaller container and sometimes allow the varnish to skin purposefully. Once the skin’s formed, the evaporation stops, and as long as I go back to it within a few days, it’s fine. Just out of curiosity, is yours a polyurethane? I don’t think marine varnish would form such a hard crust, even over time. I really like the floor, with its look of a mosaic. It will be fun to see it completed. The company is ‘Condor’ and the polyurethane product is called ‘Esplenglos’ – it dries in less than an hour, and after a few hours the next coat can be applied…. Last time in Quito I saw a water-based Esplenglos para pisos, but it was 80 a gallon, and i only needed about a cup…. but it was tempting – the first water-based for floors that I’ve seen here….. I wondered why they don’t sell the product in a different type of container that’s easier to seal/preserve til next time…. Thanks for the feedback and advice! What amazing talent you have My Dear! I just love those bamboo railings! Your space is coming to life through the actualization of your imagination. Applause and accolades! It’s lovely in its natural state but adapts well to artsy options! You’re doing an amazing job with a combination of dedication, talent and artistry! Thank you; it’s pretty easy to find creative uses for bamboo — perhaps I’ll do a post on that one of these days…. so many ideas and so few hours in each day! Do you think that “floating” your layer of plastic wrap directly ON the liquid top of your varnish might help keep it from solidifying? I found that it works to keep a skin from forming on other types of liquid that solidify with access to any air (either outside or within its container). Thank you for that advice, and I will try your suggestion. Yesterday there was an oversized styrofoam plate beneath the can, and ‘dribbles’ of varnish melted the plate. A test will be interesting to see what happens. It’s raining a lot right now – has been all day, so I’m not going to apply the third coat today…. Hopefully tomorrow… Thanks again! I love that bamboo rail, it’s such a fun idea. Thank you so much! It’s looking better, everything is pulling together. Not it’s time for a very-strategic painting to anchor the entry! I’d love to sit on the corner bench there, not to critique the art, but simply to be immersed in it. You said something about the floor design being “believable.” It’s unbelievably terrific. But who would expect anything less from Z? Be gentle on that back. No doubt this job calls for extra care in that area. Thanks! During the process, the owners of the apts have been dropping in (up?) to critique then sit and chat in the neutral space… We will all enjoy the happy space, especially those who rmember how oppressive it was a month ago! As long as it’s not a floor, you can probably use a product made by Sika, and I think I’ve seen it in Portoviejo at the Kiwy —- Kywi (((sp?) store… I’ll look to see if I can find an empty container, as that’s what was used on the bamboo handrail… Over time it yellows a little, but not much. Dear Lisa.. such a lot of work, but Oh what joy to see this emerging beautifully step by step. Francisca sounds like a blessing, and I am sure her healing hand channels straight from the source.. :-). So pleased her healing brought relief..
And I am just glad that whole tin of varnish wasn’t solid.. I love every bit of what you are doing..
And yes agree with you and your friend Cindy.. We should all make time for art.. Many thanks Lisa for sharing that wonderful story upon my post.. Loved it.. Yes, Francisca, who fights diabetes, is a giver, and she works very hard 7 days a week. Her halo is quite large and grows a bit larger each day. Thanks for your support and approval of the project! May your day go well! Thank you so much! That painting took about one full day (two half days) and then another few hours for the shadows.. Sometimes it all rolls into place and is effortless.. I credit hours and hours and hours of experience, just like the pro ball players — eventually you don’t have to think about it – it just happens. Instinctive Athletes find the same ‘flow’ in their every movement, physically in-tune with their environment; and golfers who swing-into the flow of everything already “at hand”…at THIS second. A kind of Abandon to Process, swept into and away on the Elements of engagement. A nice nexus where only ‘eureka’ finds its Mark, and Art its Spontaneity. Literally, a chemical process controlled by the Agent of Artifice in the Act of Creation. Only the kindest kiss* and gentle caress* from a loved-one can compare for richness of sentiment. Congrats. ” A kind of Abandon to Process ” === very nice summary — one has to have experienced that to understand.. thanks! If I reincarnate as a tame Parrot in Primary Colors, can I come live here and you feed me nuts and fruit?…please? The door (window) will always be open, and never a gilded cage to ‘protect’ the precious guest! Like a living Exhibit, with a Friendly Host who is no more greatly interested in anything but its Visitor, who can squawk* and chatter* and cluck* and whistle*, mimicking all the while a “language of the birds” in every Moment of experience. Delicious encounter. I can see Sets of painted collections, just like your recent beside the Perch of earlier mention (I like the depth effect, implying 3D) along the same Wall at different heights, one with long-tailed Paradise Birds in full plumage, set-off by more Parrot Perches for the transition of Perch from one ‘latitude’ to another ‘longitude’ along the Wall. Breathtaking Vision. But it IS truly different, as a matter of Fact, that the Artists’ moments are very much slowed down…like experiencing the perfect tennis stroke from a rush to the furthest side of the Court, backhand, an Urgency which only has compare in orgasmic Other experience available. So nice. Umm…Translation:…a split-moment loss of Urgency, condensed into the ‘moment’, which can last an hour, for the Hand Artist crafting such things as your lovely bird friends. In Comparison:…the Sports’ “flow” happens instantaneous, then changes radically; whereas the Craft/Hand Artists’ ‘moment’ happens sometimes over days, caught and lost in a span of time no further than the Idea of their dearest, internal devotions. A Snap Shot worth the Memory, much endeared and extended into as much ‘moment’ as can be taxed from the prevailing times and circumstance. A beloved dream. Stop Time itself, live in the Moment that most prefers Joy.Free. There are some interesting links here… I’ll be back! I love this thought and must Return it. As we said of sports, there is immediacy of “flow,” as in Art practiced in private, and over more time. But Sports spends its “flow:” in a little time; whereas the Artist can maintain the ‘moment’ for days. One is superior and closer to Instinct, I say. With sports, we have more instant gratification where with the arts, one slows, goes inward and learns patience…. and eventually we learn to leave behind the ego – that’s when the magic begins. ..